El Paso County is the westernmost county of Texas. 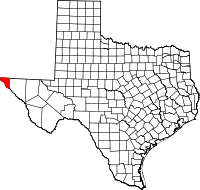 Bounded on the southwest by the Rio Grande and Mexico, on the north and west by the state of New Mexico, and on the east by Hudspeth County, Texas, El Paso County is approximately 650 miles west of Dallas and 575 miles northwest of San Antonio. El Paso County and neighboring Hudspeth County are the only Texas counties on Mountain Time. El Paso County 1922. While the Texas Republic, after winning its independence in 1836, claimed the Rio Grande as its boundary from the mouth through all its sinuous course to the West and North, even beyond the City of Santa Fe in what is now New Mexico, and the Santa Fe expedition of 1841 was projected to establish the authority of the Republic in that quarter, this jurisdiction was really nominal and it required the success of the arms of the United States during the Mexican war of 1846-48 to actually establish the Rio Grande as the international border north and west to the 32° of latitude. Thus, that portion of Texas sometimes known as the. Western Panhandle, and included between the Pecos and Rio Grande and the line of New Mexico on the north, was a Mexican territory, inhabited almost entirely by Mexican people, until the forces of the United States invaded it at the time of the Mexican war and subsequently established their various military posts in that region, including Fort Bliss, Fort Davis and Fort Stockton. The City and county of El Paso, Texas : containing useful and reliable information concerning the future great metropolis of the Southwest … 1886, El Paso Bureau of Information. Digital book online from archive.org. 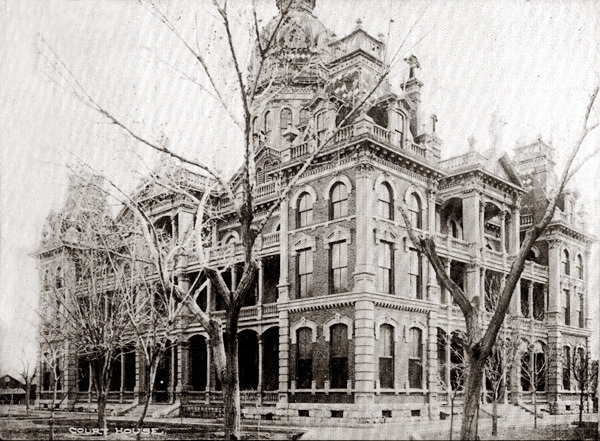 Forty years at El Paso, 1858-1898; recollections of war, politics, adventure, events, narratives, sketches, etc., 1901 by W. W. Mills Digital book online at The Portal to Texas History.